One of the bonuses of my cosy Air BnB in Edinburgh was a huge mirror and lots of light. 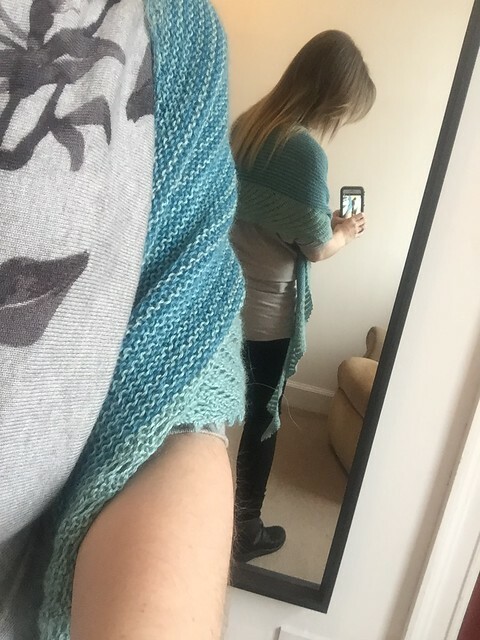 So I took the chance to take a few pictures of me wearing another project finished last year – my Cameo shawl. And then I realised that taking a picture of yourself in a mirror rarely looks good and have reverted instead to a couple of selfies. Hey ho. In short: this was a really, really boring knit which, now it’s finished, is really really wearable (phew). I always knew it’d be quite dull to make – it’s a lot of garter stitch and a pattern where you keep increasing until you cast off (picot cast off – argh!). To be fair, it gets more interesting – the stripes section livens things up a bit and when you reach the simple lace section it motors along. But there honestly is a lot of garter stitch, which resulted in this taking several months when I should have had it done in a few weeks. Thank you, and thanks for stopping by my blog. I’ve had this stored away in my pattern library for quite a bit. Seems like it’s one I need to cast on! Gorgeous color combo! It’s a beautiful end result (as long as you don’t mind garter stitch purgatory to get there!). 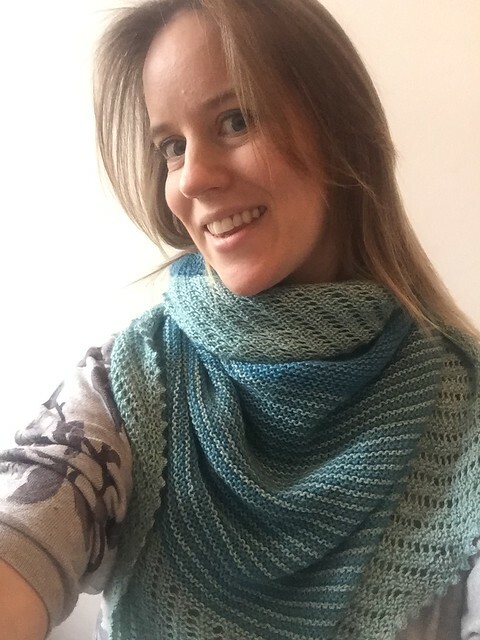 What a lovely shawl!! Those colors are so calming! The colors are beautiful and remind me of the ocean that I am currently staring at in Hawaii 🙂 I’m going to add this one to my queue since I do not mind garter stitch…especially for take a long / tv knitting! Ah now, if you enjoy knitting garter then this is absolutely the shawl for you. The end result is so lovely for something so simple.